You'll be £19.99 closer to your next £10.00 credit when you purchase Arctic Convoy PQ8. What's this? 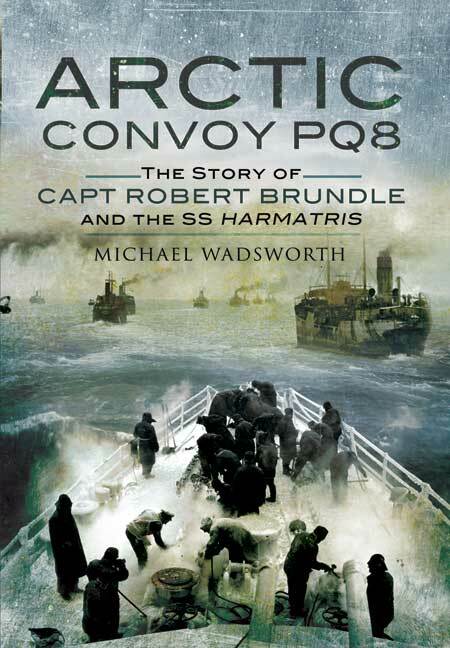 When Robert Brundle took the SS Harmatris to Russia with Convoy PQ8 he was 47 years of age. Both ship and master were veterans and had already sailed in convoys across the North Atlantic and to South Africa. The 5,395 ton coal fired ship, laden with 8,000 tons of armaments originally set sail on 27 November 1941 to join convoy PQ6 but encountered a fierce storm in which a lorry broke free in the hold and started a fierce blaze below decks. Despite valiant attempts to extinguish the fire the Harmatris was forced to return to Glasgow for repair. Having discharged its cargo, examined and repaired the holds, it restowed and finally put to sea again on 26 December. She was now to join PQ8 and Brundle was elected Convoy Commodore. Two minesweepers, a cruiser and two destroyers escorted the eight merchant vessels. On 8 January the convoy left Reykjavik bound for Murmansk. Harmatris was struck by two torpedoes in No 1 hold which caused flooding. A third torpedo struck her a few hours later and the crew evacuated to HMS Speedwell in attendance. A volunteer crew reboarded and Speedwell took the wounded ship in tow. During the night the same U Boat that had struck Harmatris sunk the destroyer Matabele with the loss of all but two of her crew. A tug eventually replaced Speedwell and the entire crew now returned to their still stricken vessel. On 18 January the ships were twice attacked by low flying Heinkels. The stricken Harmatris finally berthed in Murmansk at 0800 on 20 January. Once unloaded the battered ship entered dry dock on 10 February. The damage was considerable. In a temperature of 40 degrees below zero the crew set about the repairs. It was difficult to locate engine parts and local labour was scarce. During the following months the crew continued to work on the ship, food was scarce and the port was frequently bombed by the Luftwaffe. Several ships close to Harmatris were sunk. It was 21 July when the ship finally left for Archangel. She took aboard a cargo of 3,000 tons of steel pipes and on 13 September she was instructed to join a convoy of 20 ships, QP14 for her return voyage. On 19 September the minesweeper HMS Leda, steaming close by Harmartris, was torpedoed. The convoy was under almost continuous U Boat attack and suffered six losses. A story of heroism and high adventure totally overlaid with cold, unrelenting cold. Even the book's cover illustrations are iced over! Written by the subject's grandson, this book brilliantly describes the drama, horror, perseverance, tragedy and heroism of The Russian Convoys to Murmansk and Archangel from british ports in World War Two. Obviously, the winters were harshest. Convoy PQ8 put to sea from Glasgow on December 26, 1941. Constantly harassed by German aircraft and submarines as well as by the weather, losses were appalling. Somehow, though enough ships got through to make the risk and effort worthwhile. This is the story, told very personally of one of the most gruelling. It is very well told. An outstanding story for an outstanding maritime event.